Zach Parise scored a goal and added an assist as the Minnesota Wild snapped a five-game losing streak with a 4-1 victory against the host New York Rangers on Thursday night. Jared Spurgeon, Mikael Granlund and Jordan Greenway also scored for the Wild, and Eric Staal and Ryan Donato each had two assists. The Wild had been shut out in their previous two games and won for just the second time (2-7-3) in 11 games since the All-Star break. Goaltender Devan Dubnyk made 33 saves. With the score 2-1, Parise scored a controversial goal at 11:03 of the third period. The Rangers' Brady Skjei appeared to be tripped by Minnesota's Staal as he tried to skate the puck out of the defensive zone. The puck slid straight to Parise, who was alone at the top of the slot. Parise deked to his backhand and beat Lundqvist up high. The Wild snapped a 171-minute scoreless streak as Spurgeon opened the scoring on the power play at 15:04 of the first period. Lundqvist made a stunning sprawling save to stop a shot by Staal, who was alone at the right post, but as the goalie tried to flop onto his back to cover the puck, it squirted under his right arm and Spurgeon was able to beat two Rangers defenders to the puck to tap it into the net. Donato, making his debut with the Wild after being acquired Wednesday in a trade with Boston for Charlie Coyle, got the second assist. The Rangers tied the score at 1-1 with a power-play goal of their own at 5:06 of the second period, with Buchnevich sneaking a slap shot from the right faceoff dot between Dubnyk's pads. Ryan Strome and Tony DeAngelo got assists. The Wild regained the lead at 8:41 of the second. 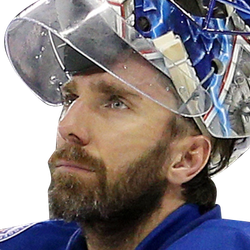 Greg Pateryn's shot from the point was stopped by Lundqvist, but the rebound went to the top of the slot, where Granlund was able to lift it over the goalie's shoulder while falling to the ice. Parise also got an assist on the goal. Greenway got an empty-net goal at 17:23 of the third, off assists from Staal and Donato, to cap the scoring.